It was a night full of love, laughter and wishes for Felicity Keats as she celebrated her 80th Birthday in style at the SABC Blue Room. Family, friends and colleagues gathered for an evening to remember. 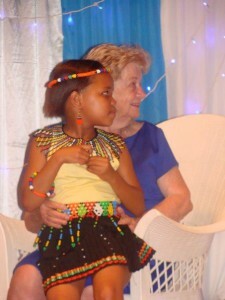 Representative from the KZN Office of the Premier were also present to wish Felicity well. Different people gave speeches and a key note performance was by Nonkelemane Langa who is President Jacob Zuma’s praise singer who recited a poem dedicated to Felicity in both English and IsiZulu where he praised Felicity for making a difference in the country and outside the country. Most people of Felicity age will be refered to as being old but in Nonkelemane’s words “Felicity is matured”. Mohammed Kathrada handled the programme with great humor, while a slide show was playing on the background of Felicity’s timeline, be it travelling, training and so forth. Her son Brian Keats and daughter were also present to celebrate their mother’s birthday. From everybody who was in attendance and those who could not make it we wish Felicity more years of good health and may she continue to be an inspiration to the young and old and make a difference in the world with her creative writing.